The Sheridan High School yearbook staff placed 10th in the nation for their 2016 Yellowjacket Yearbook at the Journalism Education Association/National Scholastic Press Association Journalism (JEA/NSPA) convention, held Nov. 10-13 in Indianapolis. Additionally, three staff members -- Bailee Hutcheson, Kristen Pinkerton and Brittney Staley -- received top rankings in their individual competitions. "I couldn't be more proud of Mr. Justin Turner and his yearbook staff for their excellent showing at the national convention," said SHS Principal Rodney Wiliams. "Placing 10th in the nation is a huge accomplishment as well as a testimate to their dedication and hard work." During the convention, each staff member competed in individual competitions. Seven staff members competed in writing while Bailee Hutcheson, senior, competed in photography. 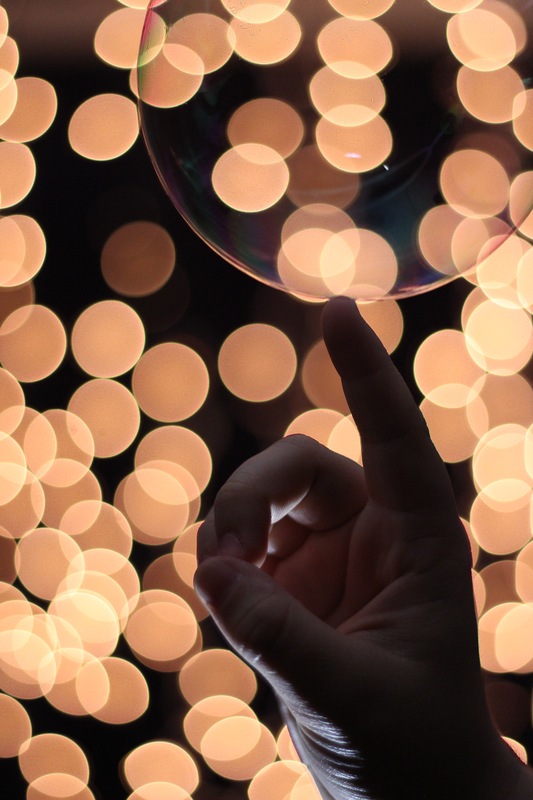 Hutcheson was awarded Superior, the highest ranking, for her photograph capturing a close-up view of a finger gently touching a bubble in front of a beautiful background of Christmas lights (shown below). She said the idea behind the photograph was to use the Christmas lights in the background to achieve bokeh, or the effect of a soft out-of-fucus background in an image. Hutcheson was not the only staff member to receive a Superior award. Kristen Pinkerton, sophomore, ranked first in the writing competition. “I didn’t expect to win Superior, so I was kind of happy because writing has been my passion since about fourth grade,” Pinkerton said. Pinkerton, as well as the other staff members competing in writing, had to write their stories on location based on information given to them at the convention. Before going into the competition, they were only aware of the writing category in which they were assigned to compete. Along with Avant, Brittney Staley, senior, also competed in yearbook copy. Staley received the Honorable Mention award in her category. According to the yearbook staff, their national convention experience is one they will benefit from for the rest of the year. For Kacie Wyrick, sophomore, the awards just gave the staff more motivation to attend the state-level convention. “If we can place 10th in the nation, we can place 1st in the state," Wyrick said. Of all the Arkansas schools that competed in the write-off contests, there were only two superior awards given, and they were both given to Sheridan students. First row, from left are Bailee Hutcheson, Mackenzie Avant, Brittney Staley, Isabella Hopkins and Selena McGuire. Back row, from left are Kristen Pinkerton, Kacie Wyrick, Justin Turner and Jake Cook.